One year after the start of the political crisis in Mali, insecurity resulting from the military coup, the Tuareg rebellion and the presence of armed islamist groups in the north have displaced hundred thousands of people. Some 55,000 refugees are still living in difficult conditions in the Mbera camp in Mauritania. A nutrition and retrospective mortality survey by MSF has revealed critical mortality and malnutrition rates. 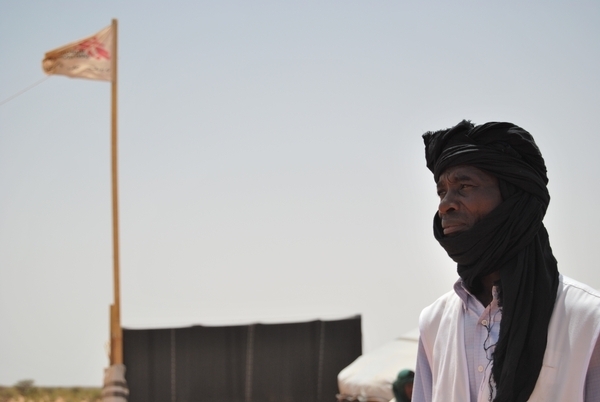 Karl Nawezi, head of MSF's activities in Mauritania, explains why the situation has reached such an alarming level in the camp, which is located in the middle of the desert, a few kilometres from the Mali border. What is the situation in the Mbera camp? MSF has run nutrition and retrospective mortality surveys in the camp. The nutrition survey revealed that the nutritional situation has not improved since January 2012 when the first refugees arrived. Nearly 1 in 5 children, or 17, percent, are malnourished and 4.6 percent are suffering from the severest form of malnutrition and are in danger of dying. This medical data reveals the difficult conditions in which the refugees in the Mbera camp are living. What are the most urgent medical problems facing people in the camp? People, mostly children, are dying from malaria, respiratory infections, or diarrhoea. In addition, we also noted that only 70 percent of children under five have been vaccinated against measles. Yet children under five are the most vulnerable; they often end up in a vicious circle in which malnutrition and measles exhaust their already weakened immune systems and lead to medical complications like pneumonia and diarrhoea. There is, therefore, an urgent need to launch a vaccination campaign that can cover more than 95 percent of children aged between 6 months and 15 years old. The food distributed in the camp is not adapted to the cultural habits of the refugees. They traditionally eat milk and meat, but these are not part of the food rations. As a result, we see some mothers reselling cereal rations to buy small quantities of milk or meat to feed their children. Some families are even prepared to return to Mali to take care of their herds and find the food they need. This demonstrates great vulnerability. Yes, if the assistance delivered to refugees is not urgently improved. The type of food aid received by refugees must help reduce infant mortality. To prevent a high number of deaths in children with acute malnutrition, we must be innovative, rethinking food aid. We could very easily imagine income-generating activities for families or even the distribution of goats among nomadic communities. At the same time, however, the situation in Mali continues to deteriorate. The prospect of a military intervention has understandably made Malians very wary of returning to their homeland. It is hard to say when the refugees will be able to return home, but many have already suffered as a result of this crisis. The influx of refugees is far from over. That is why it is important to develop longer-term solutions that are capable of improving quality of life for the refugees. In March 2012, MSF launched a nutrition programme and a health care programme in the refugee camp in Mbera. We are managing two health posts and a medical centre. We are also supporting two other national medical centres in Fassala and Bassikounou, in south-eastern Mauritania. In 2012, we provided some 45,000 medical consultations and treated nearly 1,000 severely malnourished children. We will now further increase our efforts by expanding the health promotion teams in the camp in order to identify the most vulnerable children. We are also preparing to set up a surgical unit in the village of Bassikounou. This will enable us to treat women with obstetrical complications without having to send them 200 kilometres away to the hospital in Nema.